I work in insurance, the coverage in questions is UNDERINSURED motorist coverage - which is specically for the difference between the other party's policy and your coverage - if the at fault party's coverage is less than yours. He may have stated "uninsured" coverage instead of "underinsured," but not sure that warranted the name calling. 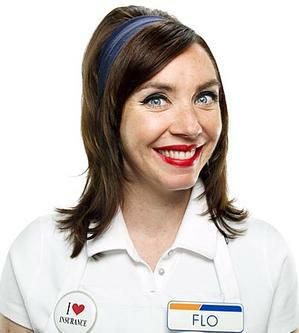 The name of the company, plus freakin’ FLO (the most irritating woman on TV) are good enough reasons to stay the heck away from them. From a link on Progressive's Twitter. They said, "To be very clear, Progressive did not serve as the attorney for the defendant in this case. He was defended by his insurance company, Nationwide." And on second review - he/she did say underinsured, so there wasn't even any mis-stating. Warning: disturbing content!! Not for small children! My Insurance Agent put me into a Progressive plan. I ran over something that fell from the back of a truck and it exploded under the right front end of my wife's van. it messed up the transmission and the right front axle/bearings. The Mechanic told the agent that he should just right it off since the front end was warped and that even the transmission mounts were messed up. The Progressive agent never told me any of this just that they were going to put in a new transmission and fix the axle. I tried six (6) times to meet with him about the van and he always found something that interfered with the time. I found out later that he had them rebuild the transmission and try to straighten the front end. I ended up putting in two whole new axles before I got rid of the truck. I have told everyone I can not to buy Progressive ever! They are the biggest con artist out there! A good moral here is that you never know if you're getting a good "deal" on your insurance until it comes time to make a claim. Good point.....I've been with the same company (Safeco) for twenty years. Made only one claim when some clown opened his car door right in front of my car. I was found to be 0% to blame - Safeco even got my deductible back. That was about ten years ago so I've been loyal to them ever since. But now they want to raise my premium by 35%. Been told they can't do that. I am investigating. Which sounds very odd because the other insurance company had already settled before. Of course since tweets are non-binding and the case is complete Progressive can tweet whatever mis-information they want without any danger of recourse. Do you live in a “No Fault” state? That might be the reason, but then I would think that your policy should have a provision for extending your medical payments. Hard to say. Some states are quite different than others. Glenn Beck’s people searched the court records, and found that the court allowed Progressive to participate in the defense. It’s in the link on the previous page. Why would Progressive request the following and get it granted from the court? 1. That Progressive Advance Insurance Company be and is hereby allowed to intervene as a party Defendant. 2. That Progressive Insurance Company is GRANTED all rights to participate in this proceeding as if it were an original party to this case. At the beginning of the trial on Monday, August 6th, an attorney identified himself as Jeffrey R. Moffat and stated that he worked for Progressive Advanced Insurance Company. He then sat next to the defendant. During the trial, both in and out of the courtroom, he conferred with the defendant. He gave an opening statement to the jury, in which he proposed the idea that the defendant should not be found negligent in the case. He cross-examined the plaintiffs witnesses. On direct examination, he questioned all of the defenses witnesses. He made objections on behalf of the defendant, and he was a party to the argument of all of the objections heard in the case. After all of the witnesses had been called, he stood before the jury and gave a closing argument, in which he argued that my sister was responsible for the accident that killed her, and that the jury should not decide that the defendant was negligent. So as it always is with lying Progressive scumbag traitors...they will twist the truth, tell only partial truths and rely solely on what the definition of “is” is to manipulate the public. I had a somewhat similar experience with State Farm back in the late 80's into the mid 90's. I will try to abbreviate this complex web as best that I can. I was rear-ended by a young driver on a busy Friday afternoon rush hour. We were both insured by state Farm. I started running into trouble right away. I only asked $600 for my wrecked 20-year-old Valiant, which had a good body and a working a/c. State Farm offered $100. I went to court with a written estimate from a used parts dealer for the engine of $600. The judge asked the SF lawyers what was their defense... they had none and the judge gave me $900 plus I got to keep the car. Then I had to go back to court because they refused to acknowledge my lost wages claim; SF used the same lawyers and they lost that case. SF fired those attorneys. My medical bills for 'whiplash' were mounting. I compulsively kept accurate records for well over two years. The judge told me that I would need a lawyer from that point on. So we sued for medical, damages, personal loss, etc. SF surrendered the young guy's policy, so we collected the full amount [and the atty got 1/3.] However my earlier judgments in court for my wrecked car and lost wages remained unpaid for some months. State law allows the insurance co. 30 days to satisfy court judgments. I took a notarized copy of my court judgment and sent it to the state insurance commissioner [Bill Nelson!!!] and asked him to seize their bond and satisfy my judgment. He never even responded to my letter. I was told by a lawyer that in order to collect my judgment I could seize properly identified property up to the value of my judgment. I went to the huge 5-storey SF office building here in Orlando and started writing down inventory numbers of the property I intended to ask the sheriff to seize. A clerk asked me what I was doing, and when I told her she got on the phone immediately with the 'upstairs'. Within 15 minutes some exec came down with a check for the proper amount... think they didn't know who I was? As in your case, I had good coverage over and above what the other guy was insured for [he had multiple accidents and was only 19 years old.] SF told me plainly that their duty was to defend the other guy against me. I had over 17 years of safe driving. How's that for customer loyalty? I understand in one sense that he was not going to sue me, but still SF stonewalled every claim that I made. Since we had settled the accident claim the medical bills came under breach of contract. My lawyer sued for the medical and got it plus whatever fee he charged... I didn't get anything from that one except my med bills paid. I never received one dollar from SF that I did not sue for... and after my first suits I had to threaten to seize property in order to get my legal just deserts. As in the settlement of the hospital bill, SF paid much more in the case of each claim than if they had honorably - and legally - dealt with me. I suppose the insurance co's figure that most people will get angry and blow their case out of frustration; when one loses their temper in important deals they lose the argument. I am glad I was equal to the task with SF. Why wouldn't they request to have a lawyer present during the trial? If they're going to be paying most of the money, shouldn't they be sure that the trial doesn't become totally one-sided? The question is whether or not their lawyer was representing the driver. Progressive says he was only representing the insurance company, not the driver, and provided no evidence at the trial. It appears as though Progressive handled this the way they should given the laws of the State. I don't understand why people think they should have just paid out the full amount while there was still question about who was at fault. lol huff post...Kleon you are either a RINO, progressive or just a plant here. If you took the time to actually refer and read a reliable source like The Blaze you would see the truth. Just to help you out with a few more facts...Betsy Morgan (former CEO of the HuffPost) joined The Blaze as CEO because the HuffPost was no longer interested in the truth but just more propaganda from the progressives. Nice talking to you. Less than 90 days and your messiah will be toppled. If you took the time to actually refer and read a reliable source like The Blaze you would see the truth. There's nothing factually incorrect about the part of the article I was quoting. Even the Blaze article you posted quotes the family's lawyer admitting that Progressive wasn't representing the defendant, which is the point I was making. He goes on to say, "Progressive did everything in their power to show that their own insured did something wrong." Well, yes. Isn't this what they would have done if the family was able to sue them directly? Surely, it's not an ideal situation for them to have to do this at the trial of the driver in the accident, but that's the way the law is set up. Progressive couldn't have defended their position any other way. You are pretty daft...FR used to have people that could actually read and not be influenced by propaganda. Jeffrey Moffet attorney for Progressive on defense team.